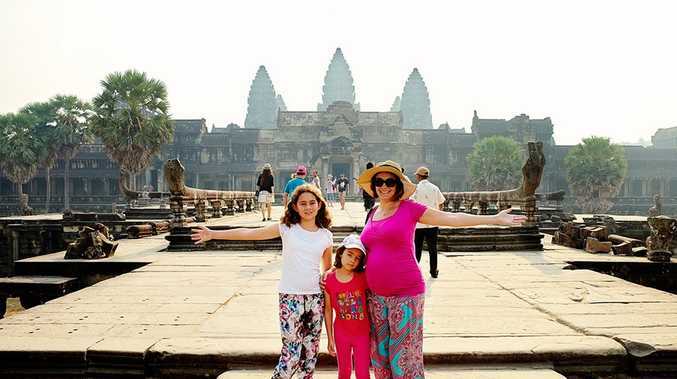 RECENTLY, our Australian family travel blog embarked on a trip to the amazing Kingdom of Wonders - Cambodia. If you are travelling with your family, or as a couple, there are plenty of things to see and do. Visiting Angkor Wat is usually one of the main reasons why people visit Cambodia. And, it comes as no surprise because Angkor happens to be one of the most important archaeological sites in South-East Asia. Inside the spectacular Angkor Archaeological Park, you will find the remains of many important sites, one of which is the incredible Angkor Wat Temple itself. This UNESCO World Heritage Site happens to be one of the most popular places to visit in Cambodia, and we were grateful to have the opportunity to explore the Angkor Wat with our kids. "Jolene and I loved checking out the famous temples. It was so much fun having Katie-Lee and Lily run around and marvel at all the spectacular carvings that decorate the walls everywhere. "I know that I was totally gobsmacked when I saw it. Yup, definitely recommend to go there! One of a kind experience!" Wanderlust Storyteller Andrzej Ejmont said. To view the family's Angkor Wat photos and their accompanying video click on the link here.